Welcome to Well Done Cooking Classes Summer Cooking Camps! In these camps, we focus on technique, taste, and fundamentals of cooking to allow our junior chefs to flex their culinary muscles. This is a 5-day Summer Cooking Camp that is progressive and looks to build upon each participants previous day learning. While the summer camp is progressive in nature, each class is designed to enhance the technique of the student to increase their knowledge of general kitchen terms and skills. Release your little inner chef! The cost of the program covers all five days. Each class lasts approximately 4 hours doing prep and clean up with the kiddos. Well Done Cooking Classes seeks to offer kids something fun, exciting, and educational to do in Houston. We are proud of our junior chefs and want to help them make the best of their Houston summer! 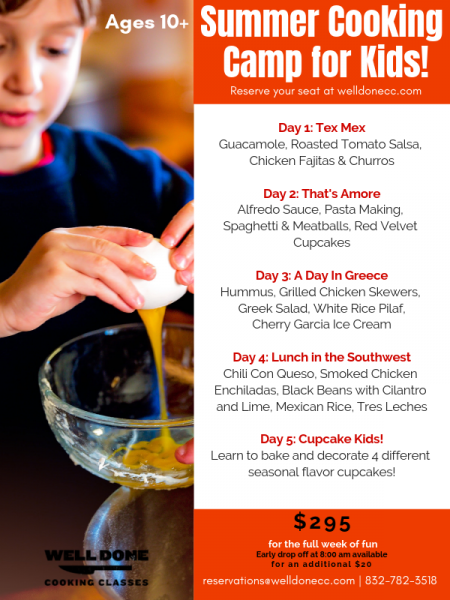 Kids cooking classes in Houston done right. Come cook with us!